About a hundred interested people joined the cluster session this year. After a short introduction by the speaker of the competence cluster NutriAct, Prof. Dr. med. Tilman Grune, the junior group leaders talked about their research and the funded groups. The moderation of the minisymposium had the DGE president Prof. Dr. Ulrike Arens-Azevêdo. For the Diet Body Brain Junior Research Group, Dr. Marie-Christine Simon gave an overview about her group. The junior research group started at the beginning of the year. The influence of commensal microorganisms and their metabolites is analyzed in order to uncover causal connections between the diet, the microbiota, the metabolism and the brain function, and finally to be able to give personalized nutritional recommendations. Simon added that she was looking forward to applications from doctoral students and postdocs. As a second speaker, Dr. Christina Holzapfel the approaches of the enable junior research group "Personalized nutrition & eHealth", short PeNut, before. The objectives of her junior research are the development and prevention of obesity. Thus, parameters in the area of ​​weight management are the focus. These will be examined as part of a lifestyle intervention study. In addition, the group is conducting a personalized nutrition survey, which is nearing completion, and is preparing systematic reviews on gene-lifestyle interactions. Dr. Andrea Henze is head of the NutriAct junior research group "Protein oxidation as an indicator of the aging phenotype and target of an individualized nutritional intervention" (ProAID). She wants to answer the questions of "how does diet influence the aging process and why the same diet has different effects on different people". Therefore, the junior research group is concerned with the importance of oxidative modifications of endogenous proteins as biomarkers for nutritional and age-related diseases such as type 2 diabetes mellitus and as regulators of metabolism. 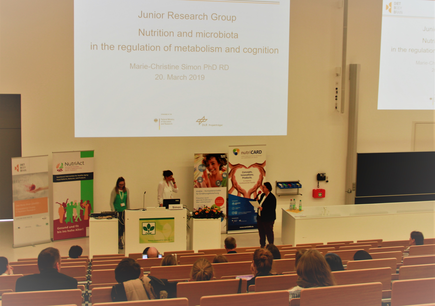 Dr. Christine Dawczynski presented the junior research group Nutritional Concepte (NuCo), from the nutriCARD cluster. The group develops nutritional concepts for different nutritional types and focuses on identifying and validating biomarkers that reliably reflect specific dietary patterns. Three human intervention studies are being carried out for this purpose; two have started, the third, which is specifically focused on omega-3 fatty acids, is in preparation.